On October 12, 2018, King Felipe VI and Queen Letizia of Spain visited Sant Llorenc des Cardassar on Balearic island of Majorca, Spain. A flash flood on the Spanish island of Majorca has killed at least 12 people, including at least three foreigners. Hundreds of emergency workers and sniffer dogs are involved in the search-and-rescue effort. A five-year-old child is missing. The dead include eight Spanish nationals, a Dutch tourist, a British couple and one unidentified victim. A very sad occasion. The flood killed a lot of people and worse a little child. No parent should have to go through this. 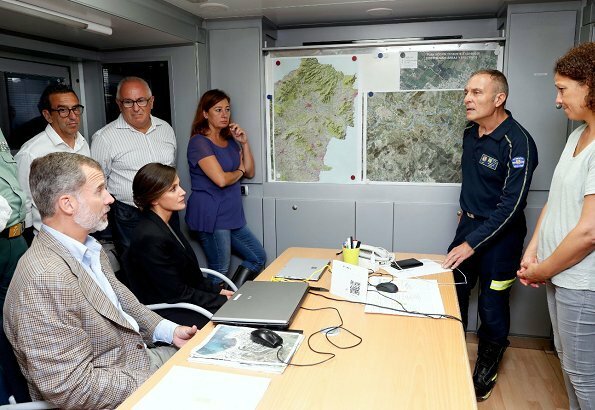 Nice to see Q Letizia give support to the victims. Good for the king and queen and Letizia is dressed so appropriately. 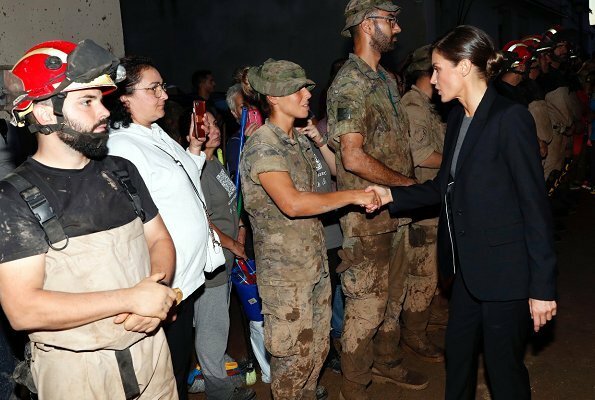 This was not a time for a big fashion statement, rather, she is understated and I am sure this visit meant alot to the people. Very sad that nature show its more harsh nature too frequently, people get hurt and killed. During hard times we have to keep together and help each other. I think its nice that the king and queen visited and showed their support. Sober event, well choosen clothes. Felipe y Letizia abandonaron el cóctel de Palacio para volar a Mallorca a consolar a los damnificados. Bien hecho. It is a very sad occassion. But it is a fashion blog, so I will comment on the fashion. The Queen looks perfectly dressed for that sad occassion.